Hopefully you’ve done all Christmas shopping last week during the “Christmas Gift Shop Week“, and can lean back, awaiting the holiday while making an effort to do as little work as possible at work. In either way, we’ve had more buzzing discussions than usual this week after Flux’s Merc Drawingboard and some recent Bashiok posts on Battle.net! My news item about Tyrael’s apeparance change has been a heated discussion, and also ignited the forums, where crimson started a thread as well. What’s up with our favourite Angel? This quite long going thread by visom was recently brought to life again by Hodl Pu, possibly by the last Drawing Board discussion about mercenaries. 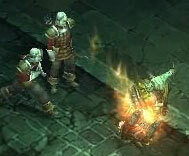 This question is more what was good and bad about the mercs in Diablo 2. Initiated from the Battle.net post by Bashiok, zero started a local discussion to brainstorm D3 affixes, and has quite a lot of good suggestions in it! On a related note to the above thread, sirroman suggested that we should have affixes that will have negative modifiers as well. New Diii.net member emceha brings back the topic of wands and Witch Doctors that psuedoenviro started a few weeks ago. A thread about skill assignment, and how the Wizard could be specced for melee combat by HappyAssassin was recently resurrected by Cardy. Remember that if you find a particularly interesting thread you should pm/e-mail me at with a link url! It doesn’t have to be created in the last week, but at least have something interesting added to it in the last seven days. Thanks for the past week’s submissions, and please be on the lookout again this week.